MorganEve Swain in the home she shared with her partner, the late Dave Lamb. WARREN, R.I. – The story of Brown Bird is a love story, and it wasn’t supposed to turn out like this. They are, or were, a band, but Dave Lamb and MorganEveSwain were partners in every sense. Their six-year romance on and offstage caught fire and burned bright when they met in 2008. They moved in together within weeks. Lamb brought Swain into the fold of Brown Bird, a scrappy Americana ensemble he had started in 2003, which drew from elements of folk, country, and blues. With the addition of Swain, a free-spirited fiddler who also plays upright bass and cello and writes and sings, the band pared down to a duo. The two of them were all that Brown Bird needed. Their records became fearless displays of genre-bending exploration, emboldened by Lamb’s lyrics, which touched on spirituality, love, and sense of self. Based in Rhode Island, they were a band destined for national prestige, and had already played shows overseas and made their debut at Newport Folk Festival in 2011. They were taking flight. But then Lamb got sick on tour. The hospital tests eventually revealed that Lamb, whose thick beard and numerous tattoos had always exuded such strength and virility, had leukemia. Not even a year later, as his health seemed to be improving after a bone marrow transplant and he and Swain got married, he had a relapse, and died on April 5, 2014. He was 36. 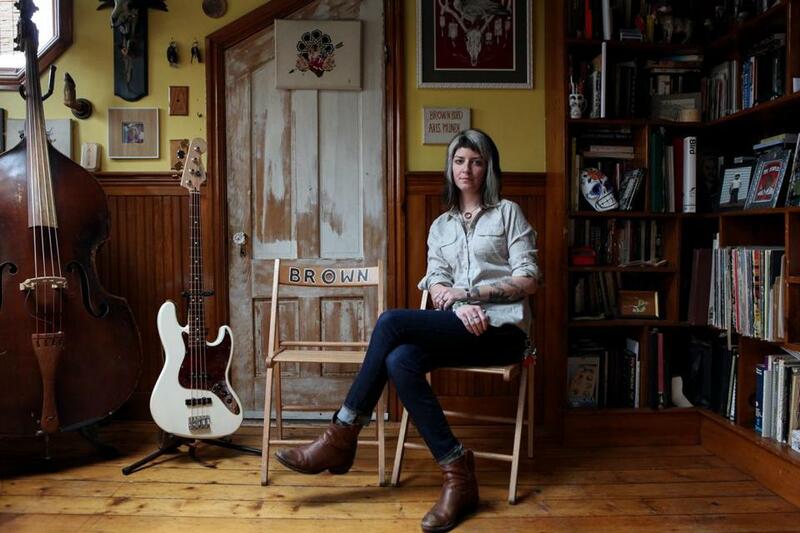 On Tuesday, Swain will release what she’s calling Brown Bird’s final album. “Axis Mundi” is one hell of a way to go out. In part, it’s a devastating account of Lamb’s year of recovery, when he was confined to their home and they built a makeshift studio to record the demos for this new record. Some of the other songs were written before his diagnosis. Weeks after Lamb’s passing, Swain went to work on shaping the album, true to the vision she and Lamb had discussed. She enlisted her brother, the musician Spencer Swain, and engineer Seth Manchester to help guide the process, working through their collective grief and finding catharsis along the way. They worked fast. “Axis Mundi” is a lean collection of muscular songs that amplify the spirit and eclecticism of Brown Bird’s earlier work. They never liked to be pigeonholed as folk or any other single genre; it simply didn’t fit. Their latest is the purest distillation of how they always wanted to sound: heavy, loud, rock-oriented. They drew on their influences at the time, a lot of psychedelic rock and surf-rock (check out the instrumental “Aloha Senor Mano” and the kamikaze rhythms of “Bannermen”), but also the world unfolding around them at home. 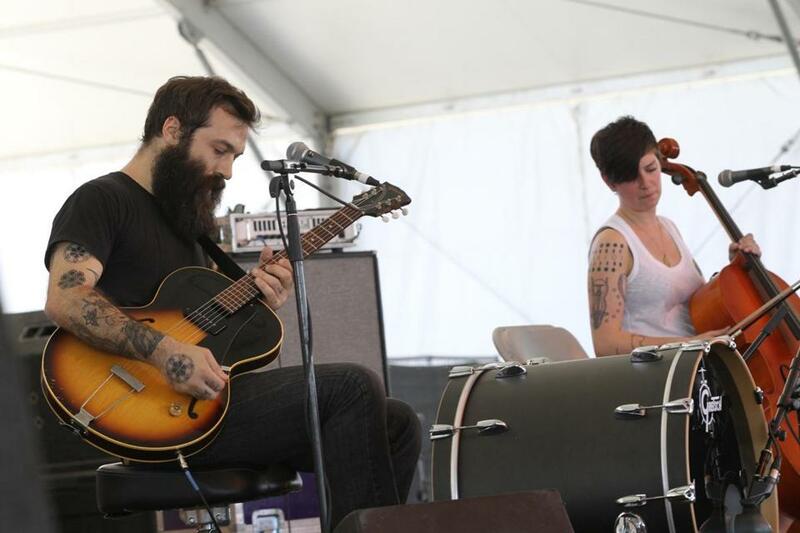 Brown Bird — David Lamb and MorganEve Swain — at Stagecoach festival in 2013. It’s tempting to filter the entire album through the prism of Lamb’s mortality. Swain wrote “Tortured Boy,” an ode to her husband, when they first met, but now it has taken on a heartrending poignancy. “I don’t want to bathe/ I’m afraid I’ll lose your smell,” she sings. The album ends with a hidden track, “Avalon,” a private recording Lamb had given to Swain as a Christmas present. It’s his tribute and musical love letter to her: “You’re a huntress and a healer and a holder of hands/ And your heart is the Avalon that I seek for my end.” Like so much of the album, its raw emotion has the power to move – and wound – you. On a recent April afternoon, not long after she has returned from touring with the band the Devil Makes Three, Swain is showing a reporter around her apartment in this Rhode Island town. Reclining with a cup of tea, she pets Zed, the amorous little dog she shared with Lamb. She had done another round of interviews the day before, which happened to be her 30th birthday. She doesn’t say so, but you sense it’s hard to live here on her own. She redecorated recently, adding a coat of warm yellow paint to the walls and moving furniture around. The truth is, their home is still a testament to their love, and Lamb’s presence is strong and vibrant, from framed Brown Bird posters to photos of the happy couple scattered throughout the rooms. On a bookcase sits a picture of Lamb as a little boy dressed as a sailor, flexing his wee muscles. She takes me into their bedroom, where an enlargement of the cover of Brown Bird’s 2013 album, “Fits of Reason,” looms over the bed. Over on the dresser is a fading red book, bound and embossed with “Lamb.” This was his lyrics book, and Swain opens it to reveal his immaculate handwriting in tiny capital letters. Spencer is credited as a producer of “Axis Mundi,” though he sees his role as more supplemental to the band’s vision. Swain eventually found her way, even though she never imagined the context in which we are now talking about Brown Bird’s final album.